OSAKA, Japan--(BUSINESS WIRE)--Panasonic Corporation's production of household refrigerators reached a grand total of 100 million in 2018, 65 years since the company first began to manufacture them in 1953. Panasonic began working on refrigerators as well as televisions and washing machines in anticipation of the approaching electrical age after the Second World War. In 1952 an alliance was formed with Nakagawa Kikai Co., Ltd., (*1) a specialist machine tool manufacturer that had made refrigerators for the Army of Occupation. 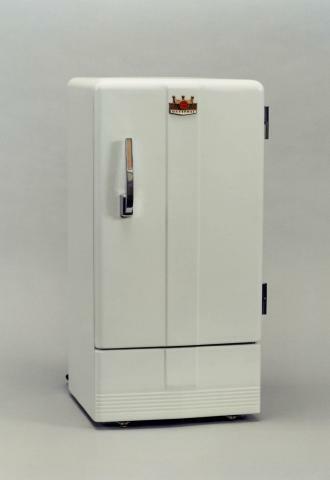 The following year, in 1953, the Takaida Factory in Osaka started production of the NR-351, the first model household refrigerator with a single door and 99 liter capacity. Product development led in 1969 to the NR-180FF, a two-door model with a separate freezer, then in 1981 to the release of the Slim NR-241HV, a three-door model with a separate vegetable compartment, to be followed by more multi-door, large-capacity models. The Compact BiG NR-F500T, released in 2005, used a top unit design with the compressor on the top, a world first, going from the previous 450-liter size to an even larger capacity of 500 liters. Panasonic's proprietary technology managed the feat of making it both more compact and yet having a greater capacity. The NR-304CV, released in 1984, incorporated a partial freezing feature to keep food fresh in a semi-frozen state of minus three degrees. A TV commercial featuring noted actor Bunta Sugawara saying "Partial is the way to go!" gained a lot of attention. The latest NR-F655WPX, to be released in March 2019, incorporates a commercial-level flash-freezing feature, achieving an even greater level of progress. The rise of environmentally conscious technology led to the release of the NR-E45M1 in 1996, which cut power consumption by half compared to our previous models, thanks to its inverter reciprocating compressor system. The year 2002 saw the arrival of the NR-C32EP, a non-CFC refrigerator using the non-CFC refrigerant R600a, and two years later, the achievement of 100% non-CFC household refrigerators for the domestic market put Panasonic in the leading position within the industry. From 2009 our refrigerators adopted Eco Navi, Panasonic's in-house-designed system for fine-tuning operations to reduce power usage, enhancing their power-saving performance. Swift moves were made to take our products abroad soon after the business began, with exports to Southeast Asia beginning in 1957. A site was opened in Taiwan in 1965, the first to produce for local consumption; currently, local manufacturing for local needs is active in Taiwan, Thailand, Indonesia, the Philippines, China, Vietnam, Brazil, and India. Panasonic will continue to develop new technologies that are closely integrated with the lives of our consumers, to both provide better and more comfortable living while also contributing to food culture. Nakagawa Kikai Co., Ltd. became a member of the Matsushita Electric Industrial Group, then changed its name to Nakagawa Denki in 1953, and finally Matsushita Refrigeration in 1972. *2 Domestic production was centralized at the Kusatsu Factory in 2003. 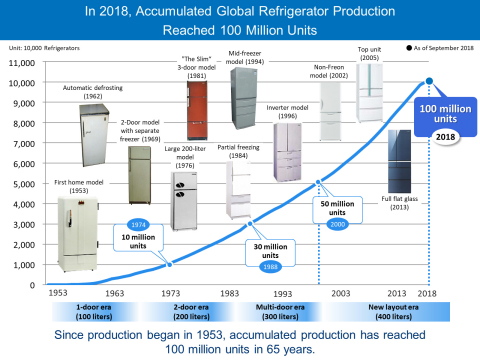 Panasonic's production of household refrigerators reached a grand total of 100 million units in 2018, 65 years after manufacturing its first model.